if you want to go climbing in todra you will probably come by airplane. the best place to land is certainly marrakesh. it's the nearest airport (apart from ourzazate which is small and expensive) and it's one of the most beautiful cities of northern africa. easyjet and ryanair both fly to marrakesh for very low fares. alternatively you can also land in fes which is also served by low cost airlines but from there it is more complicate and longer to get to todra. from the airpot to the city center of marrakesh you can take the bus for about 30 dh or take the taxi. the taxi has place for three people and is more expensive. the prices are fixed and you can see them on a sign just outside the airport. 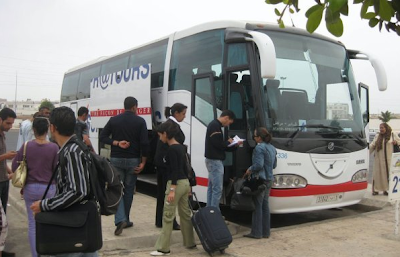 from marrakech or fes you can easily travel to todra by bus. there are two good companies that serve all major cities and villages in morocco: supratours and ctm. there is a direct connection from marrakesh to tinerhir/tinghir, a small town in 14km distance from todra. the journey last about seven hours and is quite beautiful. first the road leads over the atlas mountains and then along the valley of the draa. the bus stops a few times, the first time in a mountain village and then in ourzazate and some other towns. the ticket costs about 12 euro per person, the luggage one extra euro. it's better to buy the ticket in advance, but not absolutely necessary. you can buy the tickets at the supratour or ctm office in marrakesh in the bab doukkala place. to get back to marrakesh there is a very nice supratour bus that leaves around 5:45 a.m. from tinerhir/tinghir and arrives at marrakesh at midday. renting a car only makes sense if you are planning to see other sights apart from climbing in todra, since you won't really need a car once you're there. it's easy and not too expensive to rent a car in morocco. renting a small car at the airport with europecar for one week costs about 160 euro. the roads are good and quite safe, the street signs are in french and arabic. for the roads until todra every kind of car is ok, if you are thinking to go to the desert or up in the valleys of the atlas you may need a car with four-weehl drive. once you're there you won't need a car to get to the climbs. most are in 20 min. walking distance from the hotels and virtually all can be reached in 30-50 min. walking. there are taxis coming and going all the time between todra and tinerhir/tinghir. a place in a collective taxi costs 7 dh and renting the whole taxi 45 dh. the trip lasts about 15 min and is about 15 km long. the sight from the road is very beautiful and there are some good photo spots. the price for calling a taxi to especially pick you up from tinerhir/tinghir for a certain hour, for example in the night, is around 150 dh.